Today is a big day! For it is India VS Pakistan ICC Champions Trophy 2017 finals! Any India VS Pakistan match is a big match but when it comes to the finals of the so-called mini world cup, the social media is bound to be taken by storm. 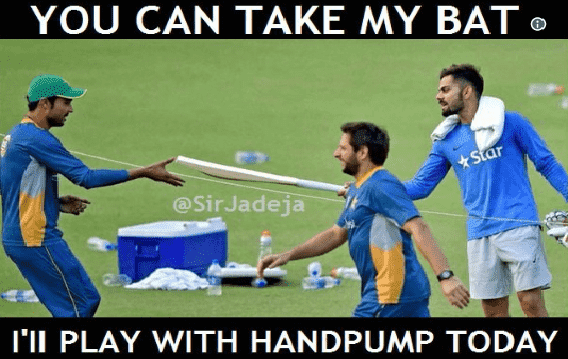 Since the day it was finalized that the finals of ICC Champions Trophy 2017 will be played between India and Pakistan, twitterati have been going crazy over it, sharing memes and GIFs. From 'Bahubali 2' memes to Salman Khan GIFs, thousands and thousands of hilarious tweets are being shared and re-shared. We bring to you those funny captions, Gifs, memes that are right out of Bollywood movies because we all know that Bollywood and cricket are two of the most glamorous industries in India and when they meet, they go viral! Pic 1 : how Pakistan twitter thinks their team plays.